Fishing around the lake has picked up in most places around Jindy with some good results coming form the western side, Snowy arm, Hatchery bay, Snowline caravan park and Hay shed bay. Polarizing around these areas are starting to pick up with the browns but remember go small Nymphs or Buzzers have been the pick most fish are very spooky after coming back from the rivers so go slow and keep low. best times are from day brake till around 9am any later things will get hard early is the go!! If you are starting late you are best going around to the east side off the lake to the deeper waters and the sun behind your back Jindy east back to the dam wall would be my pick. Late in the afternoons start using the bigger flies Woolly Buggers, Mrs Simpsons, Fuzzy’s, Woolly Worms. Overall Jindabyne has really picked up and is starting to fish well on all counts. them but if you put the time in you will get good results. are looking good with the rainbows this year. With the rainbows the reports have been good with the fishers catching some real crackers and in good condition so by all counts the rainbows should be back this year. 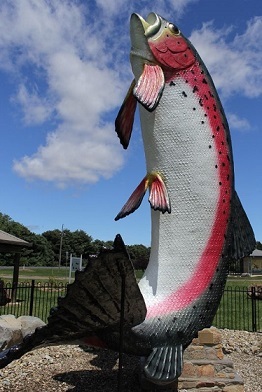 the reports have been good up the Eucumbene river with the rainbow going up and as time goes by they should be in full swing by mid August only time will tell i will be going up after August to have a look myself I’ll let you know how things are going. Remember the browns are coming back into the lake they should start moving closer to the shoreline so stay low use small flies. Overall Braemer bay has been the best place to go bait fishing with Buckenderra not to far behind.